Around a decade ago, more or less, I wanted to revisit my teenage years by shopping ebay and finding and buying, my all-time favorite boombox, a Panasonic RX-C39. 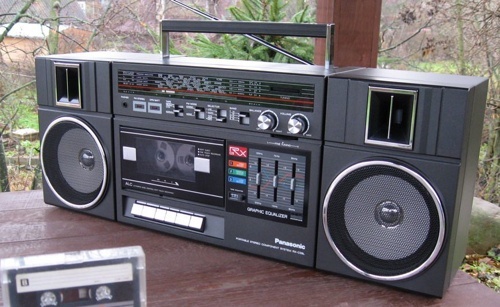 I LOVED this boombox so much! It was perfect for me. Stylish, good sound (for its time and for not as discriminating ears as I have now), and it was a present from Santa! I was not interested in carrying around my boombox; I wanted one that would fit on my headboard above my pillow. More, I really wanted detachable speakers so that I could place each speaker on either side of the bed, and aim it at my head for optimal listening enjoyment. And because my parents bedroom was right next to mine, I would, at night when they were trying to sleep, put each speaker right next to each ear and turn it down to the lowest volume. You could not hear the music at that volume from two feet away, let alone another room through the walls. But for me, it was very loud! Prince’s Purple Rain never sounded so good to me as a fifteen year! One feature the Panasonic RX-C39 had that I had forgotten; RCA inputs! That meant I could connect another audio device, like a CD Player, to the boombox! And, pertinent for this review, I could connect the Rocki Play to my old boombox, thus turning it into a “new” Airplay system. 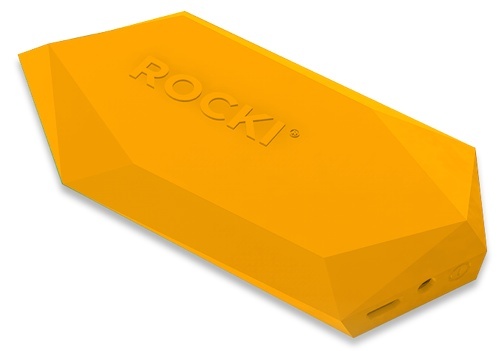 The Rocki Play is a small Wi-Fi audio converter. With the Rocki Play, it acts as an Airplay device, meaning you can stream audio from any iPhone, iPad, or Mac directly to the Rocki Play, which in turn is connected to a speaker or your home entertainment system. Rocki Play comes with the two most common audio cables: 3.5MM (headphone) to RCA, and 3.5MM to 3.5MM cable. In my case, I connected the Rocki Play to my boombox via the 3.5MM to RCA cable. Once connected to your home (or office) Wi-Fi, it acts as an Airplay device. During the set-up process, the user has the ability to name the Rocki Play, which is the name that shows up in your Airplay options in iOS. Does it work? Yes! And it works very well. Once the initial set-up is complete, it just works. Why, some of you may be asking, is the point of connecting via Airplay on your Wi-Fi network when you could just use a Bluetooth speaker? Good question! It’s simple: you will have MUCH greater range on your Wi-Fi than you would via Bluetooth. With Bluetooth, the average range is less than 40-50 feet at a maximum. With Wi-Fi, which more than likely reaches throughout your entire house or apartment, you have greater range, so you can be far away from the Rocki Play and continue to pump the jams to your speakers. The Rocki Play does have a small internal battery, giving you around four hours of play. It charges via an included power plug Mini USB cable. If you have a stationary audio system you plan on using, just leave the Rocki Play plugged in to the power and you never have to think twice about it. Rocki Play started life as a KickStarter project, initially asking for $50,000. By the end of its KickStarter process, they had raised over $200,000, so there is clearly a lot of interest in this type of technology. It is terrific being able to repurpose my old boombox as an Airplay speaker system. It’s a given that it does not sound as well as even the speakers connected to my Mac, but it’s more a nostalgia thing for me. And I can use my old boombox again without having to listen to the radio or try and hunt for some horrible sounding cassettes! Is all perfect with the Rocki Play? Sadly, no. There is a distinct buzz, some sort of interference, that crops up from time to time but is audible on my boombox. I tried another stereo system, and I could also hear the faint, but annoying, buzz. I’m not sure what the problem is, or what inside the Rocki Play is causing it, but moving it as far away from the speakers seems to help. I put the Rocki Play on the other side of a book, and the buzzing went away. So it is kicking out some interference. There is also a Rocki Play app in the App Store, and I plan on giving that a try at some point. But my needs are simple; I just wanted to wirelessly send music, podcasts, and NPR to my old boombox. For that, the Rocki Player works well. It comes in a variety of colors. MyMac.com Rating: 7 out of 10. Has any used this for mobile use? Instead of bt headphones out this your pocket and use earbuds?